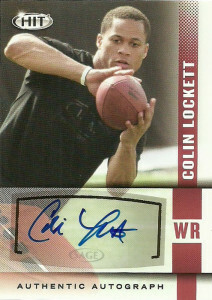 Colin Lockett had an intriguing college career playing at San Diego State. He began on the defensive side of the ball in 2011, and then was moved to wide receiver the following year, where Lockett hauled in 58 catches for 970 yards and eight scores. His 1,744 yards from scrimmage were second most on the team, as he made his living returning kicks as well. With another solid outing under his belt in 2012, he’d catch 20 passes for 293 yards and 2 TDs, while he’d return 35 kickoffs for a 25.9 yard average and two scores. Considered one of the nation’s true deep threats, Colin had 52 receptions for 736 yards, 5 TDs, and 31 returns for 761 yards. He’d go unselected in the 2014 draft, but sign a free agent contract with the Bengals. He’d end up on their practice squad for a few months, but eventually be cut. Colin later found a home with the Redskins- a team he’d bounce on and off the roster of as a practice squad member through 2015. At last glance in early 2016, he was on the roster of the BC Lions, before finding free agency again.